MoonMarble.com - Geoffrey Beetem - "Ribbon Spiral Marble"
Art Glass → Contemporary Handmade Marbles → Geoffrey Beetem - "Ribbon Spiral Marble"
This is a contemporary handmade marble by Geoffrey Beetem. It has two wide bands of pink, purple, and copper aventurine that spiral around a yellow latticino core. 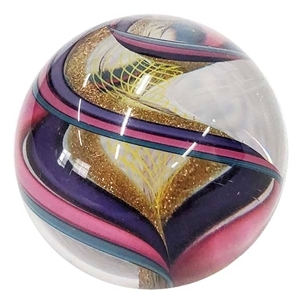 The marble measures approximately 1 5/8" in diameter. It is signed and dated.